EBOOK. GOD is spirit---and we are His flesh on earth. It all started with Jesus Christ, the WORD that became flesh and dwelt among us. Then he passed on the legacy to us. When the WORD is made flesh, it conquers the world and conquers evil. It defeats Satan. It overcomes the world. This is what the e-book God's Flesh is all about---providing flesh for the Word, living the LIFE of Jesus Christ everyday. Click here to buy the e-book. We're born again not to do religious dead works again. Often, after getting born again, we just transfer to another religion or church. But God's design is that we're born again to do the Father's work in exactly the way Jesus did it. That's why Jesus lives in us. "And the Father's work is to believe in the One He has sent," [John 6.29]. On the day we finally and really believe the WORD, we will understand that the Father and the Lord Jesus are really and fully (100%) living in us through the Holy Spirit in us---and that we, completely one in Christ, are God's flesh on earth. Glorify God in our bodies. That's the goal, said Paul. And the body is flesh. Thus, the body is God's flesh. God inhabits our flesh in Christ and we live in God through Christ. In fact, we no longer live in this body but Christ does. Once we all manifest God in our bodies (all of us living the LIFE of Christ), true unity among believers will happen, and there will be one glorious church of Jesus Christ, which is without spot or wrinkle or any other blemish. Denominations will disappear. In fact, as I'm writing this review, it's already happening! Then genuine Kingdom building on earth by the glorious church will start. But as it is, only empires of men they call "churches" are built and "planted" everywhere, not God's true church and Kingdom. However, God will do a powerful move before Christ comes back---in fact, the last move of God---which will come about according to deeper and radical insights in Scriptures. 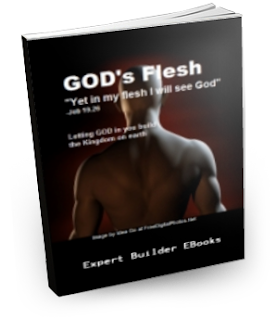 This e-book shares a gist of this powerful spiritual revival---the last revival before Jesus Christ comes back. Find out about it and join God in His last move on earth in these end times. For only P200, get a PDF copy of this 80-plus page e-book. Pay through Paypal. After payment, Paypal will take you to the page where you'd find a link for downloading a PDF copy of the e-book. To buy now, please click this link.